After assessing their posture and watching their movement patterns it is clear to me why their shoulder is aching. Many shoulder problems are related to movement and postural patterns, age, and trauma to the joint. When we exercise shoulder muscles properly depending on the health and the condition of the joint; we can hopefully alleviate and prevent most of these traumas from occurring in the first place. · Protective Phase: The arm should be immobilized, do not exercise shoulder muscles until pain and inflammation is controlled. · Mobility Phase: Begin to do passive (assisted) range of motion exercises, and scapular stabilization exercises can begin. · Strengthening Phase: Usually begins 4-6 weeks after the shoulder injury. Some of the best ways to exercise our shoulders focus on strengthening the posterior rotator cuff muscles (internal and external shoulder rotators) and the shoulder horizontal abductors and adductors (these muscles raise and lower the arm from your side). 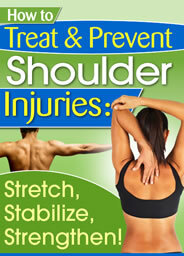 Check out more ways to exercise shoulder muscles with the new Shoulder ebook available here. A partial or complete tear may occur after a trauma such as a fall. Sometimes minor stress can easily cause a partial or complete tear of the tissue already weak from chronic impingement or degenerative changes in the shoulder. A person younger than 35 years generally injures the rotator cuff with trauma from overuse. Someone who is older than 35 years develops rotator cuff injury from under-use and it progressively worsens. These problems can lead to instability, possibly spurs forming which cause chronic impingement and possibly bursitis. After being continually impinged a degenerative rotator cuff tear can occur. First identify the underlying causes, some of which are listed below. 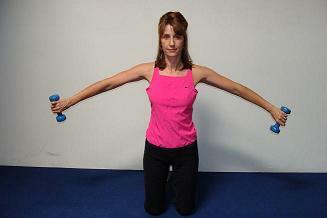 Then exercise the rotator cuff muscles in a pain free range of motion. 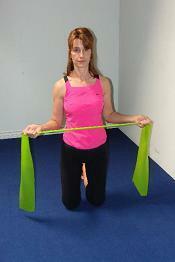 Theraband exercises for shoulder muscles is helpful in strengthening the posterior rotator muscles. This can be done as shown in the picture here, externally rotating the shoulder muscles by pulling the band away from your middle. Find more theraband exercises for the shoulder and upper back muscles here. AVOID postures or movements that trigger pain or inflammation. This may be all overhead activity. Eliminate all causes of the shoulder impingement so the tissue can heal. Address posture and movement mechanics. Incomplete tears in the Rotator Cuff are treated in the same way as for Impingement Syndrome. Complete tears are often treated through surgery to decompress and repair the tissue. Occurs most often in the female population from 40 to 60 years. There are typically 3 stages over 3-5 months each. Progressively worsens in the first stage, then stays the same, and then progressively improves. With appropriate treatment it may improve faster. The best approach is to prevent frozen shoulder in the first place and to frozen shoulder exercise through strengthening, stretching, and stabilization exercises. I especially like the dumbbell circles to improve range of motion exercise for the shoulder joint, you can do this from a standing position like shown in the picture. Generally the frozen shoulder occurs in the dominant arm, which is not mobilized often enough. This syndrome is becoming more and more prevalent in Dental Hygienist’s and as people work on the computer. These activities cause tightness in the neck, pectoral muscles, poor posture, and abnormal breathing patterns. Postural correction and scapular stabilization exercises to promote a more upright posture. Stretch the scalenes of the neck and the muscles of the chest. To exercise shoulder muscles and assist in stabilizing the joint I have listed below what I believe to be one of the most effective shoulder rehab exercises. Only consider shoulder weight training once the underlying causes are addressed and you have first stabilized the shoulder girdle musculature. This can be done starting with the exercise listed below. Lying on your stomach with your elbows flexed and directly under your shoulders, lift your chest drawing your abs and ribs up and off the mat so that your upper body weight is supported on your forearms. Actively press your forearms and elbows down into the mat, imagine pulling your body forward. Feel your scapula (shoulder blades) widen, as well as the chest. Keep the back of the neck long; chin is a fist length from your chest. Check out more ways to exercise your shoulder with all the free articles and information about different shoulder conditions by going here.